Yesterday and today I've been at home with a cold. 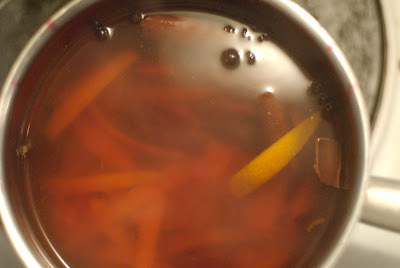 When I'm sick during the winter, I often like to warm up with a cup of hot spiced cider. I pour a liter of apple juice into a small pot, and add a few cinammon sticks, cloves, and alspice seeds, as well as the juice of a small orange and strips of orange peel. I throw in a few tablespoons of sugar and a pinch of salt, and bring the mixture almost to a boil. I let it simmer for 20-30 minutes and then take it off the fire to cool. 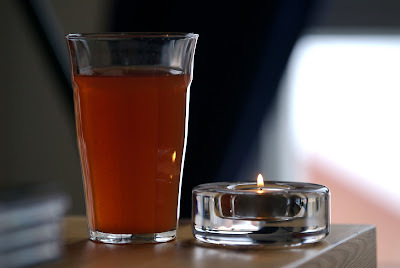 The result is a hearty, spicy cider that seems to warm my whole body the moment I take a sip. The aroma of the cider reminds me of the many ski vacations I have taken with my family in Colorado. In addition to being warm and tasty, the cider also contains lots of vitamin C! I'm already feeling much better than I did yesterday, and I imagine I'll even go climbing tonight if I still feel okay later in the afternoon. BloggerBot is dead. Long live BloggerBot!